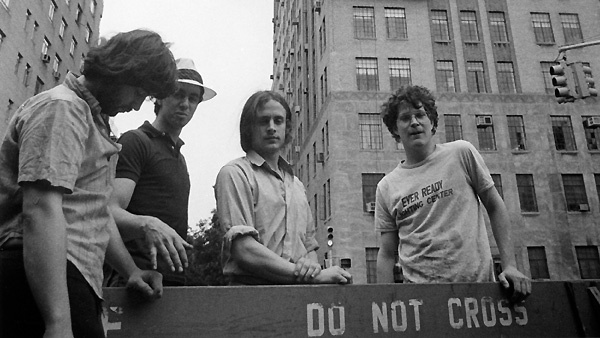 AVANT: Peter Epstein, David Fried, Christopher Hart Chambers, Marc Thorne. NYC, 1983. 1980 lower Manhattan. The streets are strewn with refuse, there are layered graffiti tags, peeling decrepit walls, and manipulative advertisements for crap everywhere you look. The daily public street-experience a pounding affront to our culture’s deeper sensibilities and priorities - except for the more visionary writers at large - a self-interest consumer landscape void of its inhabitants' poetic expressions. Avant, the first artist group in NYC to adorn public spaces with their handmade unique works of non-calligraphic art was born out of that vacuum. An apparent cultural niche was explored that begged evolution in New York’s short-lived cycles of natural selection. Until that point, everything that was street was done on the street. Beyond graffiti, early Basquiat SAMO texts and Haring’s crawling baby began to appear. Until Avant’s efforts as artists to use the street as an exhibition space for works that were created in the studio on paper that may otherwise be owned, exhibited and collected had never been explored. Ultimately, Avant produced thousands of acrylic on paper paintings and plastered them on walls, doors, bus-stops and galleries city-wide. The idea of forming an anonymous group of young artist guerillas that would be capable of mass distribution tactics like commercial ad-agencies was a radical idea that aimed at a mass shift in public accessibility, awareness and engagement in visual art. The street-as-gallery tradition was born. After avant, this venue has become an evolving world wide establishment as countless artists and creative people make sure that the avant garde is not restricted to the elite institutions of art alone. Avant is dead, long live the avant garde.